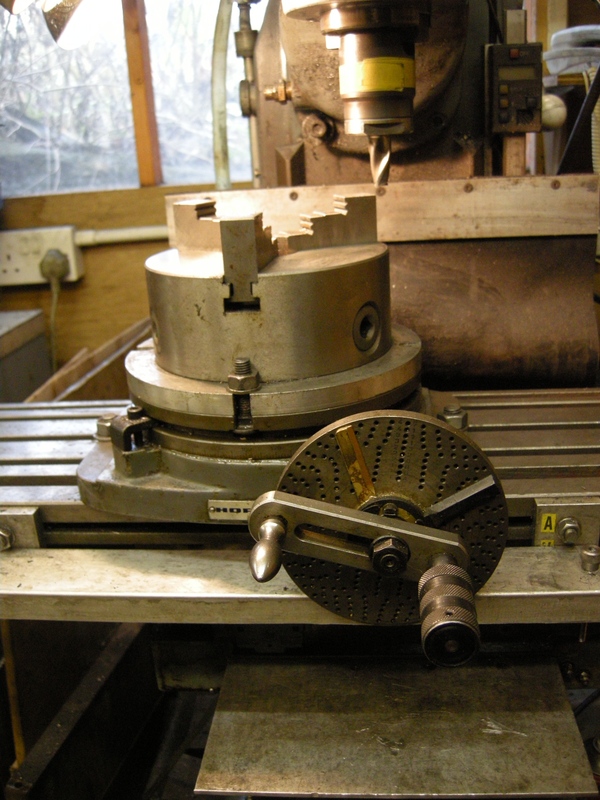 This is the same whether the chuck/rotary table is going to be used in the horizontal or vertical position. The chuck can be held on the rotary table by using an adapter plate. This plate is machined so it has a piece on its top surface that fits exactly into the recess on the back of the chuck. This plate is slightly larger than the diameter of the chuck. There are slots milled to match the slot on the rotary table. These are used to clamped the chuck onto the rotary table. The plate also has a hole in it. This is used to align the chuck with the rotary tale. The easiest way to do align the chuck fitted to the adapter plat to the rotary table is to make a spigot that has one end that fits the hole in the rotary table. The other end fits in the milling chuck. The aligned chuck on adapter plate is shown next.